In IS-Retail new type of MRP/RP procedure has been introduced W – Replenishment (IS Retail) . At the beginning it’s worth to mention that it can be used only for stores and Customers and not for distribution centers. The solution is quite similar to MRP with reorder point or time phase planning but I leave it for you to decide at the end of this article. Configuration starts with setting in article master. First decision is how inventory management is going to be used for replenishment. Setting for type of inventory management to use. 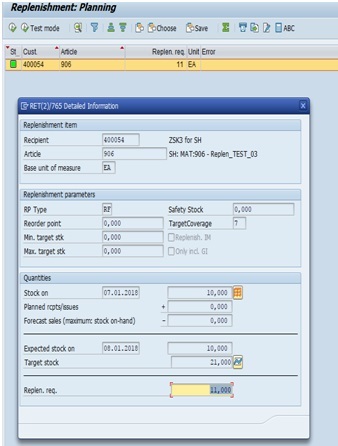 In Replenishment, you have the option of using the detailed inventory management in Materials Management (MM). Alternatively, you can use Replenishment-Based Inventory Management, which is designed for a more simplified system. Recommended approach is to use as much as possible full MM oriented setting which is more accurate and allow more options (like ATP influence) in calculation of required quantity. On the other hand it has some limitations like the fact it can only be used on articles with value and quantity update. Second option is mandatory in case if you have articles managed on merchandise category basis (value-only article). Calculation of required quantity is much simpler comparing to MM option. Calculation logic is based only on stock on-hand (anticipated goods receipts might be taken into account if parameter Correct RS is set in article master data), which by simplifying means expected stock is equal to stock on-hand. In this article only MM oriented approach is presented. Second step of configuration is setting up configuration data for store. 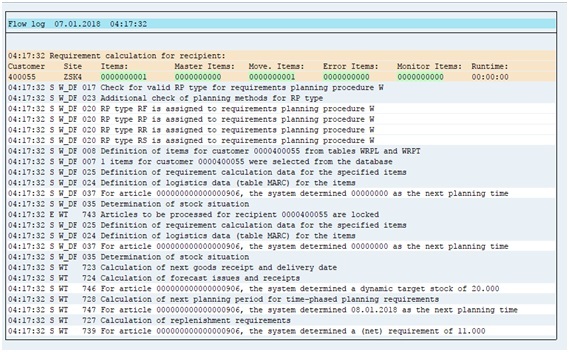 As in Sap Manufacturing outcome of MRP is either internal production (production/process orders ) or external procurement (purchase requisition/schedule line for schedule agreement). In SAP Retail logic is a bit different and it’s important to decide what type of document is created as result of run of planning. This information comes from Store Order control parameters which is part of POS Inbound profile. As shown on the screenshot above, system decides what type of document to create based on source of processing (replenishment or store order) and type of source of supply assigned in article ( 1 – standard, external, 2 – internal, from distribution center). As mentioned before, Store Order profile is included in setting of POS inbound profile which is assigned to the site. If no assignment exist then system by default creates Sales Order type TAV (Standard Order (VMI)). As mentioned POS Inbound profile consists of several settings including beside Store Order profile as well: Aggregated sales, Sales as per receipts which are used for inbound sales Idoc communication from POS systems (respectively Idocs: WPUUMS01, WPUBON01). Even if these settings are not so much important for “classic” replenishment but are very important for multi step replenishment. In order to exclude articles that use Replenishment from standard requirements planning, the articles must be assigned RP procedure W (Replenishment (IS Retail)) via replenishment type. 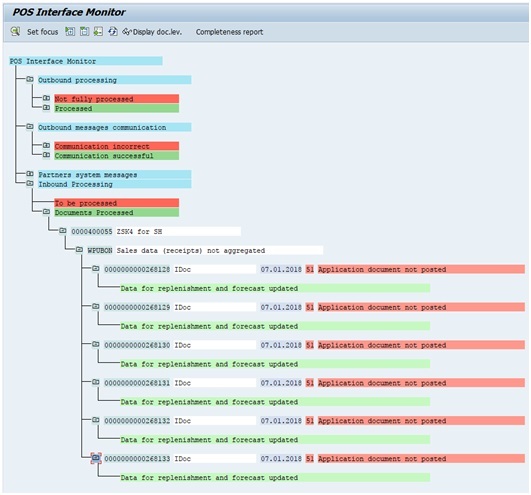 Following replenishment (RP) types are used in SAP Retail. Replenishment types RS and RR are same as respectively RP and RF beside they are used in Multi-step replenishment which is described later on. The major difference between RP and RF is how target stock is calculated. 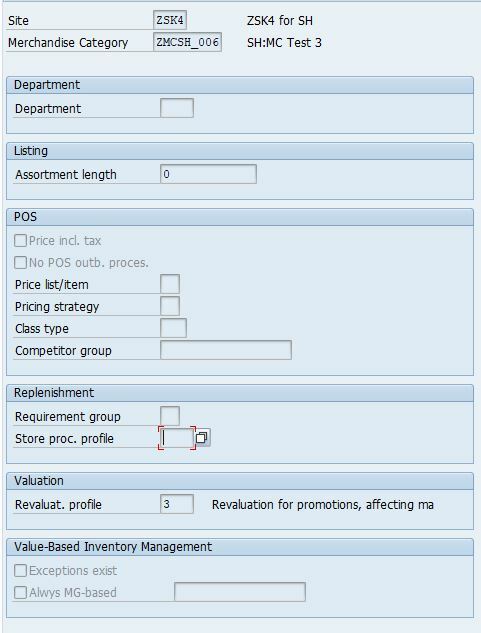 RP type use static calculation and target stock value is set in logistic view of store in article master data. Future GR/GI or forecasted sales can be taken into account as an option. This approach is very similar to MRP procedure reorder point used in for example V1 or V2 MRP types. 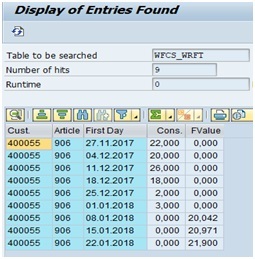 RF type use dynamic calculation by automatically calculating the target stock by totaling the predicted consumption values for the period today plus target range (replenishment parameter set in article master data in logistic view) of article and store concerned. Target stocks are determined on the basis of forecasted sales means, a forecast run is a prerequisite for this method. Rcpts/Issues (via ATP) – as name indicate and check rule is always set by system to RP. 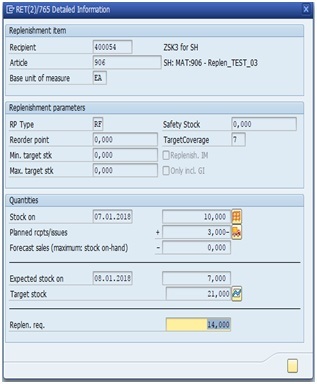 Include forecasted issues – valid only for static target stock determination, while dynamic always use it for calculations. Planning is run on 07/01 (Sunday) for next 7 days. Forecast for the article for whole week is 21EA. In this case target coverage period is 7 days means is equal to whole week but if coverage period would be 3 days then system should forecast quantity as 21EA (total forecast for period)/5 (number of working days) * 3 (number of working days to cover) = 12,6 EA (rounded to 13EA). Based on settings in Store Order profile and source of supply of article, STO Purchase Order should be created as follow-on document. 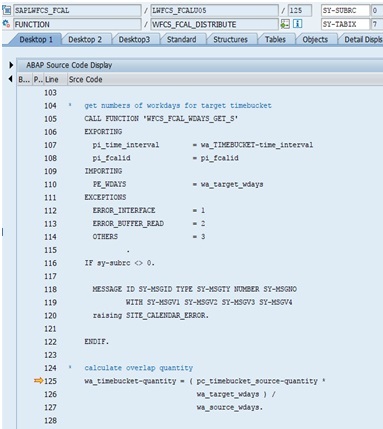 determining requirements calculation data – compile and save the master data required for requirements calculation. requirements calculations – determine requirements. generate follow-on documents – follow-on documents are generated. Within multistep replenishment, the two-step procedure only uses the programs for requirements calculation and follow-on document creation. The program for determining the requirements calculation data is not used in the two-step procedure. The three-step procedure uses all three of the programs in multistep replenishment. As in non multi-step replenishment for dynamic target stock, forecast is mandatory. Unlike for “classic” replenishment, multi-step uses its own sales forecast (POS history + sales forecast values) that is calculated using transaction WFCS01. 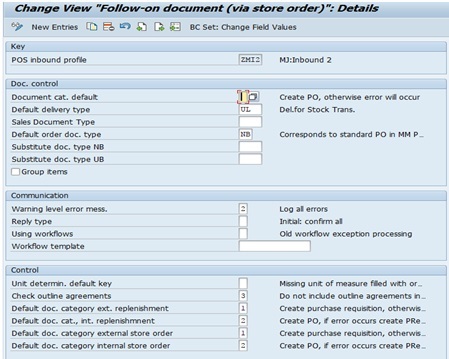 To be able to use multi-step replenishment POS Inbound profile needs to be update. This profile is assigned on site master data or in site/merchandise category level. For both Aggregated sales, Sales as per receipts field “Update replenishment-based inventory management” must be set to 1 – Special Replenishment-Based Inventory Management. Article 906 for store ZSK4 is created. RP type RR is assigned. Sales data are sent from POS system via Idocs: aggregated transactions – WPUUMS01, Individual transactions: WPUBON0 1. (Tables WRPL,WRPT are updated). Calculation of forecasted sales (no goods issue is posted yet). Inbound Idocs are reprocessed and GI is posted. Requirements calculation is run. Logic for determining target stock is the same as described above. Due to current stock is 9EA (Initially 100EA – 91 EA posted from POS Inbound Idocs) system calculated required quantity to 11 EA. In second (or third depending on approach) step transaction (WRSO) for generation of follow-on document is run. Based on settings in Store Order profile and source of supply of article, STO Purchase Order should be created as follow-on document.